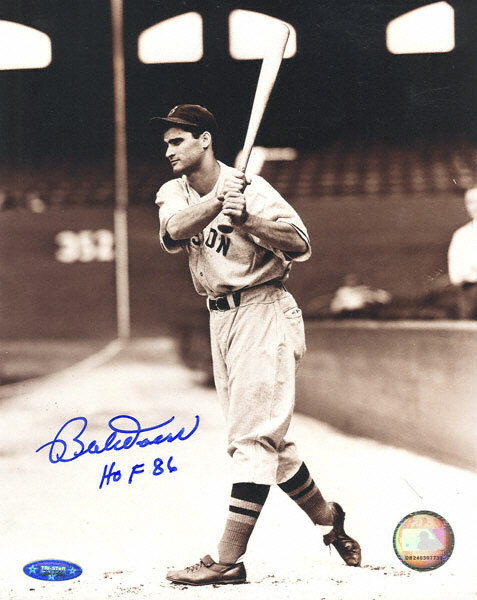 As a beloved fan favorite and legend of the Boston Red Sox, Bobby Doerr cards and autographed memorabilia remain popular today. Doerr played his entire 14-year career with the Red Sox where he was an All-Star nine times. What constitutes a Bobby Doerr rookie card has always been a subject of debate. His first card issued during his playing days is from 1936-37 Goudey Wide Pens. Initially, his name misspelled and so it was reissued. He also has two cards in the 1938 Goudey Heads-Up set. 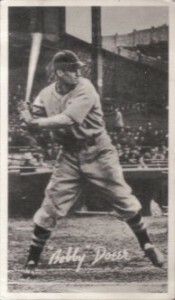 Another popular early card of Doerr is his 1939 Play Ball issue. Doerr's first autographed card is in 2000 Fleer Greats of the Game. It features an on-card autograph. The card is not serial numbered and an exact print run has never been released. His first memorabilia cards were also produced in 2001. His 2001 SP Legendary Cuts card contains pieces of a Doerr game-used bat. His card from 2001 Topps Tribute contains swatches of game-worn jersey material. Bobby Doerr's autographed memorabilia remains quite collectible. Demand for his signature is fueled by new generations joining the Red Sox Nation and learning about the team's heritage and history. 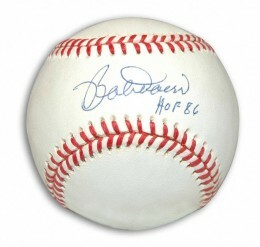 Signed baseballs and photographs are the most commonly found items. Originally released in 1936, this card was an error card. It incorrectly spelled his last name "Doeer." In 1937 the card was corrected as part of a follow-up set. 2009 Signature Card Auto Bobby Doerr "HOF 80"
Below you will find an example of what Bobby Doerr's authentic signature looks like. This can be used as a first point of reference for determining the legitimacy of autograph memorabilia, but is not a substitute for having your items authenticated by a well-respected professional autograph authentication company. Some of the trusted sources within the sports memorabilia market include the following companies: PSA, JSA, Steiner, Mounted Memories and Tristar. Click on any of the images below to view full size photos. Written in cursive, he usually signs "Bob" for his first name. The "B" contains three distinct loops with a small tail to the right. The pen lifts and starts the top of the 'o" which is open. The "b" is small but legible. It flows directly into the "D" which displays a distinct sideways loop at the top of the letter. The remaining letters are also all legible. The "o" is again open, but the "e" is not.